By nature, common names are always going to involve some disagreements. In some cases, several species may share a common name. In other cases, the common name of one species may be mis-applied to another species. Accepted common names also may not always exist within the common vernacular. These are some of the issues that are already mentioned on iNaturalist's Curator Guide as a portion of the policies governing the platform. To summarize the guidelines, common names used on iNaturalist should meet several criteria: be actual names in use by more than one person, be as specific as possible, follow appropriate capitalization guidelines, and not be needlessly duplicated unless species truly share a specific common name. One of the things that I often do while curating taxa is verification of common names to make sure they meet local requirements. For instance, I recently ended up having to purge several mass-duplicated Spanish names (10-30+ pages per name), including a large number of species that were simply noted as avispa (wasp). Over the past year or so, I've particularly been researching common names for members of the genus Polistes to make sure that we're actually using the best common names as default names. I've included what material I've been able to procude thus far on the genus below. NOTE: Unless explicitly stated otherwise, the following names are in use, either locally or in the literature. I have included a few notes on a few names that do not appear to be in use but would follow guidelines existing elsewhere in the scientific community. If any common names are missing, please let me know so this listing can be updated. • Umbrella Paper Wasps - This common name is the most specific and, to my knowledge, is only applied to this genus. The name originates from the typical overhanging structure of the nests, which often are curved much like an umbrella. • Umbrella Wasps - This is technically a truncated name but nonetheless used heavily. I would opt for using the fuller common name as the default simply for the sake of completion. • Paper Wasps - This common name technically applies to other members of the subfamily such as Mischocyttarus and Ropalidia so really is not specific enough to warrant use at the genus-level. Use would also be duplication of the common name of a higher taxon, which goes against guidelines. • Ringed Paper Wasp - This common name is based on the specific epithet (meaning ringed). This common name is preferable due to not having overlapping use. • Jack Spaniard Paper Wasp - This is an expanded form of the common name that's used in some circles to better note the taxonomic placement of the species. • Jack Spaniard Wasp - This common name is sometimes applied to various members of the canadensis-group, including P. lanio and P. crinitus and doesn't appear to apply to one species in particular. Jack Spaniard, also known as Spanish Jack, was a Chickamauga, a Cherokee siding with the British in the Revolutionary War. His legacy is variably as a patriot or an outlaw and, as such, was associated with the likes of Belle Starr . How this name became applied to these species of wasps is still a mystery to me. • Apache Paper Wasp - The primary common name is based on the specific epithet of the species. Of interest, the species is native to Texas and was in range of the Apache tribe. • Apache Wasp - This is technically a truncated name but nonetheless used heavily. I would opt for using the fuller common name as the default simply for the sake of completion. • Texas Paper Wasp - This common name is based on the range of the species. This common name should not be the default as it may need to be applied to P. texanus (currently synonymized as a form of P. apachus) in the future if the work of Dr. Buck (et al.) verify it to be a separate species. • Arizona Paper Wasp - Due to the very restricted range, this common name doesn't show up too often but is valid nonetheless. This common name is simply based on the range of the species and the specific epithet. • Golden Paper Wasp - This name is based on the specific epithet (meaning golden) and the tendency of this species to be heavily marked in yellow. This is one of the few common names of this genus held as authorized common names by the Entomological Society of America. • Dark Paper Wasp - Though occasionally noted, this common name seems to be more carried over from P. fuscatus so probably shouldn't be applied here. • Bahaman Paper Wasp - This name does not appear to be in use but is based on the specific epithet and range. This would be a logical addition for the sake of communication. • No common name - Rather regrettably, I can find no true common name for this widespread species. Several experts in the genus note that no legitimate common name exists. • Warlike Paper Wasp - This name does not appear to be in use but is based on the translation of its specific epithet. This name had been in use on iNaturalist for a while but didn't seem to be used outside of the network and those citing the network. • Red Paper Wasp - This is one of several species that occasionally gets this name applied. This is based on the almost purely red coloration of the species. The only US occurrence is in Arizona, where it simply comes in from Mexico. If a new, unique, more appropriate name were to be created, I would suggest Red Mexican Paper Wasp. • Fine-backed Red Paper Wasp - This is an emended form of the common name to separate this species from P. rubiginosus and is based on the diagnostic ridging on the propodeum (the rear portion of the thorax). This emendation probably should be used with all common names for this species. • Red Paper Wasp - This is one of several species that occasionally gets this name applied. This is based on the almost purely red coloration of the species. The other primary species to use this name, P. rubiginosus, shares both this and the other common names due to their long history of being synonymized until their recent separation. No common name appears to apply to one and not the other, and the history in the literature really can't be trusted for this reason. This common name also frequently is used in association with other fuscatus-group paper wasps such as P. metricus. • Red Wasp - This is technically a truncated name but nonetheless used heavily. I would opt for using the fuller common name as the default simply for the sake of completion. There's the additional issue that there are also two yellowjacket species that can go by this name, so it seems best to opt for a name that's just a bit less overused. • Orange Paper Wasp - This name was cited in a key produced by the CDC, but the name appears to be in very restricted use. • Mahogany Paper Wasp - I've seen this name used more infrequently, but the name may be a bit more accurate to the coloration. I only opt against using this as the default common name since Red Paper Wasp is in such heavy use. • Executioner Paper Wasp - This is an expanded form of the common name that's used in some circles to better note the taxonomic placement of the species. I generally prefer this form to separate it from less related wasps. • Executioner Wasp - This name is based on the translation of the specific epithet, which is based on the rather intense pain from being stung of this species. • Asian Paper Wasp - This name is based on the native range of this species. This appears to be the best common name for the sake of not excluding rather decent amounts of its original range. • Chinese Paper Wasp - This name is based on the specific epithet and a portion of the species' range. This name can be shared by at least one other species. • Japanese Paper Wasp - This name is based on a portion of the species' range. This name can be shared by at least one other species. • Comanche Paper Wasp - This name is based on the specific epithet of the species. Of interest, the subspecies P. c. comanchus is native to western Texas and was in range of the Comanche tribe. • Navajo Paper Wasp - This name does not appear to be in use but is based on its specific epithet. The subspecies P. c. navajoe is native to Arizona and was in range of the Navajo Nation. The name currently is already used by Mischocyttarus navajo, which also occurs in Arizona. • Cuban Paper Wasp - This name does not appear to be in use but is based on the specific epithet and range. This would be a logical addition for the sake of communication. • Caribbean Paper Wasp - This common name is based on the range of the species. This is one of the most common species throughout the Caribbean Islands. • Jack Spaniard Wasp - This common name is sometimes applied to various members of the canadensis-group, including P. annularis and P. lanio and doesn't appear to apply to one species in particular. How this name became applied to these species of wasps is still a mystery to me. • Dominican Paper Wasp - This name does not appear to be in use but is based on the specific epithet and range. This would be a logical addition for the sake of communication. • European Paper Wasp - This common name is primarily used in the US to refer to this introduced species. This is one of the few common names of this genus held as authorized common names by the Entomological Society of America. Within Europe, this is one of several cryptic species, so this common name is of less use there. • No common name - Rather regrettably, I can find no true common name for this widespread species. As far as casual identifications go, this may be one of several species that gets lumped under the Common Paper Wasp name. This is rather problematic as that name is shared by P. exclamans and P. fuscatus already. • Hunter's Paper Wasp - This name does not appear to be in use. While not a true common name, this may be the closest there is to one based on taxonomic history. After being split from P. fuscatus, the species temporarily was known as P. hunteri. • Red-headed Paper Wasp - This name is based on the specific epithet (red head) and the appearance of this species. The body coloration is entirely black apart from its distinct red head. • Guinea Paper Wasp - This is one of the common names cited by Dr. Matthias Buck (et al.). As the name definitely is not based on the Guinea in West Africa or on New Guinea in Oceania, my only suspicion on the name is that it comes from the Guinea in Gloucester County or Caroline County, both within Virginia. • Guinea Wasp - This technically appears to be a truncated name but nonetheless used somewhat frequently. I would opt for using the fuller common name as the default simply for the sake of completion. • Common Paper Wasp - This is one of several species to use this common name and one of two to occur within the same range within the US. • Zebra Paper Wasp - This name was cited in a key produced by the CDC, but the name appears to be in very restricted use. • Yellow Paper Wasp - This is one of several species to use this common name. This name is based on the specific epithet (meaning yellow) and the appearance of the species. • Dark Paper Wasp - This common name is based on the specific epithet (meaning dark or smoky) and the appearance of the species. • Northern Paper Wasp - Insofar as I can tell, this common name was applied to either a single subspecies or a group of subspecies from the northern states. I would opt for focusing on a more fully inclusive default name. • Golden Paper Wasp - Insofar as I can tell, this common name was applied to a single subspecies, now understood as the distinct P. aurifer. This name probably should not be associated with both species, particularly as P. fuscatus often does not have such extensive golden markings and as the Entomological Society of America has assigned this as the authorized common name exclusively for P. aurifer. • French Paper Wasp - This is an expanded form of the common name that's used in some circles to better note the taxonomic placement of the species. • French Wasp - This common name is based on the specific epithet (meaning French) and the epicenter of this species' occurrence. • Giant Brown Paper Wasp - This common name is based on the specific epithet (meaning giant) and the general color of the species. • Australian Paper Wasp - This common name is based on the range of this species. While a number of other species occur within its range, this is easily the most common species within its range. • Common Paper Wasp - Within Australia, this species sometimes is known by this name due to its prominence. This common name, however, is shared among a number of different species within widely different ranges and, thus, really is not a helpful common name. • Tasmanian Paper Wasp - This common name is based on an old synonym for the species, Polistes tasmaniensis, which was only applied to the nominate subspecies. The history appears to be that specimens found on Tasmania, an island just south of Australia, were thought to be a separate species until compared to those on the mainland. This common name is mostly used in new Zealand. • Unstable Paper Wasp - This common name is based on the specific epithet of the species and its behavior. This species is often noted as being rather twitchy. The common name in Spanish translates as the "Guitar Paper Wasp" and also refers to this behavior. Personally, I would have preferred the name Crazy Paper Wasp, but I wasn't asked when the existing name was applied. • Dark-waist Paper Wasp - This name is based on the coloration of this species. In comparison to most of the other species within its range, this species is almost uniquely characterized by the darker markings on the first abdominal segment. Jack Spaniard Wasp - This common name is sometimes applied to various members of the canadensis-group, including P. annularis and P. crinitus and doesn't appear to apply to one species in particular. Jack Spaniard, also known as Spanish Jack, was a Chickamauga, a Cherokee siding with the British in the Revolutionary War. His legacy is variably as a patriot or an outlaw and, as such, was associated with the likes of Belle Starr. How this name became applied to these species of wasps is still a mystery to me. • Horse's Paper Wasp - This is an expanded form of the common name that's used in some circles to better note the taxonomic placement of the species. • Horse's Wasp - This name comes from the common name used in the islands of the Caribbean. I've been unable to find a definitive origin, but I suspect that it's a reference to the large size of this species. • Yellow Horse's Paper Wasp - This name does not appear to be in use for subspecies P. m. major but is an expansion based on separating this subspecies by color. • Red Paper Wasp - This is one of several species that occasionally gets this name applied, specifically to subspecies P. m. castaneicolor. This is based on the almost purely red coloration of the species. The only US occurrence is in Arizona, where it simply comes in from Mexico. If a new, unique, more appropriate name were to be created, I would suggest Red Sonoran Paper Wasp. • Red Horse's Paper Wasp - This name does not appear to be in use for subspecies P. m. castaneicolor but is based on a combination of the species' common name with the modifier of the distinct color of this subspecies. • Metric Paper Wasp - This common name is based on the specific epithet (meaning meter or measure) and can apply to physical measurement or poetic meter. This version is in slightly lesser usage but is preferable due to not being partially in Latin. • Metricus Paper Wasp - This is an oddity among common names as it's literally the specific epithet without any sort of translation. The specific epithet simply means meter or measure and can apply to physical measurement or poetic meter. • Red Paper Wasp - This appears to be a mis-application of the name in the far southeast states. I would suggest against adding yet another synonym to this common name. • Mexican Paper Wasp - This name does not appear to be in use but is based on the specific epithet and range. This would be a logical addition for the sake of communication. • Myers' Paper Wasp - This name does not appear to be in use but is based on the specific epithet. The species may well have been named in honor of John Golding Myers, a British entomologist and hymenoterist who did work throughout the world, including South America where this species occurs. This would be a logical addition for the sake of communication. • Myers' Variegated Paper Wasp - This name does not appear to be in use but is based on the specific epithet. This name additionally notes the immense similarity to P. versicolor, of which P. m. myersi used to be considered a synonym. • Curaçao Paper Wasp - This common name is in rare use for subspecies P. m. curassavicus and is based on the specific epithet and range. This species only occurs on the "ABC" Islands of Aruba, Bonaire, and Curaçao and was originally described on Curaçao. • Yellow Oriental Paper Wasp - This name is based on the bold yellow coloration of the species and its native range throughout Asia. • Macao Paper Wasp - This name is based on the occurrence of this species in China as well as one of the species' junior synonyms, P. macaensis. This is one of the few common names of this genus held as authorized common names by the Entomological Society of America. • Palm Paper Wasp - This name is based on the specific epithet of the species, which in turn is based on the tendency of this species to make nests in the vicinity of palm trees. • Peruvian Paper Wasp - This name does not appear to be in use but is based on the specific epithet and range. This would be a logical addition for the sake of communication. • Coarse-backed Red Paper Wasp - This is an emended form of the common name to separate this species from P. carolina and is based on the diagnostic ridging on the propodeum (the rear portion of the thorax). This emendation probably should be used with all common names for this species. • Red Paper Wasp - This is one of several species that occasionally gets this name applied. This is based on the almost purely red coloration of the species. The other primary species to use this name, P. carolina, shares both this and the other common names due to their long history of being synonymized until their recent separation. No common name appears to apply to one and not the other, and the history in the literature really can't be trusted for this reason. This common name also frequently is used in association with other fuscatus-group paper wasps such as P. metricus. • Tropical Paper Wasp - This common name is based on the range of this species throughout the tropical regions of Asia, particularly including southern China, India, and Indonesia. • Yellow-zoned Paper Wasp - This common name is based on the yellow markings on the back of the thorax and the front of the abdomen that look sort of like a single yellow band. • Variegated Paper Wasp - This name is based on the specific epithet (meaning variegated, diverse in coloration, or irregularly patched). This is a much more accurate name than the more frequently published name and better captures the yellow spots on its black abdomen. It's also simply a less irksome name. Sadly, it's not used nearly as frequently. • Yellow Paper Wasp - This common name is based on the prominent yellow spots on the abdomen. This is one of the few common names that simply irks me since there are a number of yellow paper wasps across the globe (with at least 2-3 others having this as a valid common name). • Weyrauch's Paper Wasp - This name does not appear to be in use but is based on the specific epithet. This species was named after Wolfgang Karl Weyrauch, a hymenopterist who named and described a number of species within this genus. NOTE: This listing is a work in progress based on literature review. At current, this listing is limited to the Americas. As many countries lack a good photographic and taxonomic reference, it's possible that some of the specie names listed below include synonyms, obsolete and unrecognized taxa, or misreported species. At some point, I hope to be able to expand this information into some decent guides. Distributional notes are based on the work of Dr. James M. Carpenter (1996) with some updates based on recent taxonomic work. As always, the work by Dr. Matthias Buck has been a major basis for species occurring in the US and Canada. 2017. Polistes carnifex (Fabricius, 1775) in GBIF Secretariat. GBIF Backbone Taxonomy. Checklist Dataset https://doi.org/10.15468/39omei accessed via GBIF.org on 2018-01-23. 2017. Polistes major major in GBIF Secretariat. GBIF Backbone Taxonomy. Checklist Dataset https://doi.org/10.15468/39omei accessed via GBIF.org on 2018-01-23. 1944. Bequeart, J.C. The social Vespidae of the Guianas, particularly of British Guiana (Hymenoptera). Bulletin of the Museum of Comparative Zoology at Harvard College, vol. 94, no. 7, pp. 249-304. 1925. Bequeart, J.C. Two new color forms of Polistes major Palisot de Beauvois from California and Arizona (Hymenoptera: Vespidae). Entomological news, vol. 47, no. 1, pp. 7-13. 1902. Viereck, H.L. Notes on Vespoidea. Entomological news and proceedings of the entomological section of the Academy of Natural Sciences of Philadelphia, vol. 13, no. 1, pp. 273-274. Species of Polistes, commonly known as Paper Wasps, can often be a difficult group to identify to species. A number of species can appear superficially similar, so misidentification by casual observers is rather common. This quick guide is intended to quickly run through matters of diagnosis and similar species for US species. This is not intended to handle all cases, and some traits may not always be visible in photography. • P. canadensis: This species is restricted to Arizona and has a longer, narrow first abdominal segment. • P. fuscatus: This species is easily differentiated by the lack of orange antennal tips. • P. major castaneicolor: This subspecies is restricted to Arizona and lacks a yellow band on the abdomen. • P. metricus: This species is easily differentiated by the lack of orange antennal tips. Additionally, the underside of the second abdominal segment is extremely convex. P. metricus generally lacks a yellow apical band, but the presence alone is not diagnostic for P. annularis. • Generally with two near-parallel yellow lines on the scutum, or upper side of the thorax (absent in the P. apachus "texanus" variety). • P. aurifer: Red forms of this species are differentiated by the spots on abdominal segment 2 being merged together. Yellow marks on the scutum of the thorax are possible in both. • P. bellicosus: Southern forms of this species may have yellow spots restricted to segment 2 but generally nothing beyond. These spots typically are smaller than in P. apachus as well. • P. dorsalis californicus: This species is restricted to California and doesn't overlap with P. apachus. • P. kaibabensis: This species is easily differentiated by the less discrete, smooth color grading on the abdomen from red to yellow and the lack of spots on abdominal segment 1..
• P. major major-castaneicolor: This subspecies is easily differentiated by the lack of yellow spots on abdominal segment 1. • P. palmarum: This species is easily differentiated by the lack of yellow spots on abdominal segment 1. • P. bahamensis: This species is restricted to the southeastern states on the Atlantic coast. • P. dorsalis: This species is easily differentiated by the lack of orange antennal tips. • P. exclamans: This species has more extensive yellow markings on the side of the thorax. • Yellow spots on the abdomen, generally but not always merging with each other and the yellow bands. • P. apachus: Similar to red forms. This species generally has noticeable separation of the abdominal spots on segment 2. Yellow marks on the scutum of the thorax are possible in both. • P. dominula: This species is differentiated by having bright, nearly-neon antennae and four yellow marks on the scutum of the thorax. • P. dorsalis californicus: Similar to red forms. Within California, red forms of P. aurifer are only known from the San Diego and Riverside county area. • P. dorsalis neotropicus: This species is generally separated by the abdominal spots being more toward the sides and fused with the bands. • P. fuscatus: Similar to dark forms. This species generally has variable red spots on the abdomen instead of yellow spots and occurs in eastern states. Note that P. aurifer often is considered to be a subspecies, P. fuscatus aurifer. • P. arizonensis: This species is restricted to Arizona. • P. instabilis: This species is restricted to the southern tip of Texas. • P. apachus: This species is generally differentiated by having yellow spots on all abdominal segments. • P. arizonensis: This species is easily differentiated by its orange antennal tips. • P. aurifer: Red forms are generally differentiated by having yellow spots on all abdominal segments, usually fused with each other and/or the yellow bands. • P. bahamensis: This species is easily differentiated by its orange antennal tips. • P. dorsalis: This species is differentiated by the presence of dark markings on the hind femora and the generally smaller size. P. dorsalis dorsalis has more restricted yellow markings on the clypeus. • P. exclamans: This species is easily differentiated by its orange antennal tips. • P. hirsuticornis: More rarely encountered. This species is differentiated by the presence of bristly hairs on the antennae, absense of propodeal fovea, and shiny body. • P. major major-castaneicolor: This subspecies is easily differentiated by the greater yellow markings on the tip of the abdomen. Unlike P. bellicosus, this subspecies always lacks yellow spots on abdominal segment 2. • P. palmarum: This species is easily differentiated by the lack of yellow spots on abdominal segment 1. Unlike P. bellicosus, this species always lacks yellow spots on abdominal segment 2. • P. annularis: This species is easily differentiated by lacking the narrow first abdominal segment and having a yellow band on the abdomen between segments 1 and 2. • P. carolina: This species is easily differentiated by lacking orange antennal tips and lacking the narrow first abdominal segment. • P. major castaneicolor: This subspecies is restricted to Arizona and lacks the narrow first abdominal segment. • P. rubiginosus: This species is easily differentiated by lacking orange antennal tips and lacking the narrow first abdominal segment. • P. major (major): This species is highly similar to red forms of P. carnifex but is noticeably smaller. This species is most reliably differentiated by having a shorter oculomalar space and, by inspection, appears to only have antennae with orange restricted to the tips. • P. canadensis: This species is easily differentiated by its orange antennal tips. • P. major castaneicolor: This species is easily differentiated by its orange antennal tips. • P. fuscatus: Red forms of this species are differentiated by having the dark mark around the ocelli extending to the antennal bases and by having dark antennae. • P. rubiginosus: This species is differentiated by having silvery hairs on the gena and coarse ridges on the propodeum. If the body is marked, with black. • P. comanchuis navajoe: This subspecies is restricted to Arizona. The thorax is marked with red, and the second abdominal segment is black. • P. kaibabensis: This species is restricted to Arizona and Utah and is easily differentiated by the red head and thorax. • P. comanchuis comanchus: This subspecies is restricted to Texas. The thorax lacks red marks, and the second abdominal segment is red. • Scutum of thorax with 4 yellow marks at the "corners"
• P. aurifer: Black and yellow forms are easily differentiated by the lack of orange antennae. • Males have a tubercle (bump) on the underside of the abdomen. • P. arizonensis: This species is restricted to Arizona and is easily differentiated by its orange antennal tips. • P. bahamensis: This species is restricted to the southeastern states on the Atlantic coast and is easily differentiated by its orange antennal tips. • P. bellicosus: This species is differentiated by the lack of dark markings on the hind femora and often has more yellow on the clypeus. This species is also larger than P. dorsalis. • P. instabilis: This species is restricted to the southeastern tip of Texas and is easily differentiated by its orange antennal tips. • P. parametricus: This species is differentiated from dark forms of P. dorsalis dorsalis by lacking the abdominal tubercle. 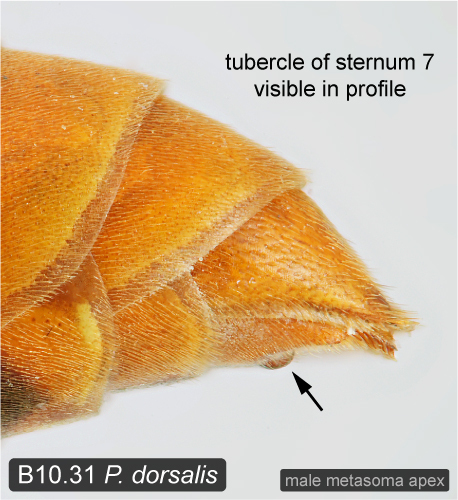 Males also have darker tyloids at the antennal tips. • P. apachus: This species is differentiated by more distinct spots on the abdomen and does not overlap with P. dorsalis californicus. • P. aurifer: Red forms of this species in California are only known from the San Diego and Riverside county area and often have merged spots on the second abdominal segment. • P. bellicosus: This species has more restricted yellow markings and isn't known to overlap. • P. carnifex: Red forms are easily differentiated by their orange antennal tips and aren't known to overlap. • P. dorsalis neotropicus: Red forms are primarily differentiated by range and their entirely yellow propodeum. • P. kaibabensis: This species is easily differentiated by the less discrete, smooth color grading on the abdomen from red to yellow and the presence of contrasting orange antennal tips. • P. major (major): This species is easily differentiated by its orange antennal tips. • P. major major-castaneicolor: This subspecies is larger and has a straight yellow band on abdominal segment 1. • P. palmarum: This species is larger and has a straight yellow band on abdominal segment 1. • P. aurifer: This species is generally separated by the abdominal spots extending more toward the middle of the segments and separated with the bands. • P. dorsalis californicus: Red forms are primarily differentiated by range and their two thin yellow stripes on the propodeum. • P. bahamensis: This species is restricted to the southeastern states on the Atlantic coast and is differentiated by its black coxae. • P. bellicosus: This species is differentiated by the lack of dark markings on the hind femora and often has more yellow on the clypeus. • P. dorsalis: This species is easily differentiated by the lack of orange antennal tips and the restricted yellow spots on the side of the thorax. • P. instabilis: This species is restricted to the southeastern tip of Texas and is easily differentiated by the lack of yellow bands on the apical abdominal segments. • P. aurifer: Yellow forms generally have stronger, more contrasting red markings and more red on the femora. • P. carolina: This species is reddish to orange but never golden. • P. rubiginosus: This species is reddish to orange but never golden. • Note: Highly variable! This species can resemble many other very different US species. • P. annularis: Red and black forms are easily differentiated by the orange antennal tips. • P. aurifer: Similar to dark, spotted forms. This species generally has variable yellow spots on the abdomen instead of red spots and is a western species. Note that P. aurifer often is considered to be a subspecies, P. fuscatus aurifer. 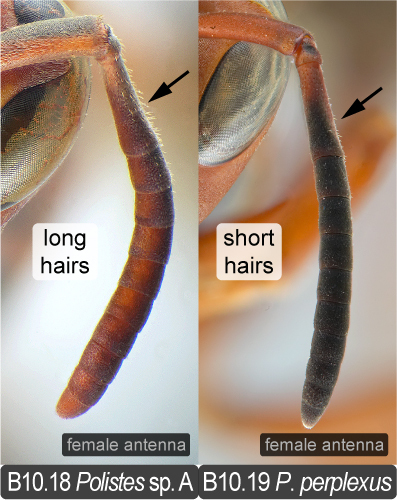 • P. carolina: This species can be differentiated from red forms by having a restricted dark mark around the ocelli not extending to the antennal bases and by having dull-orange undersides of the antennae. • P. dominula: This species is easily differentiated by its orange antennae and lack of red markings. • P. dorsalis (dorsalis): Both red-and-yellow forms and dark forms of each species can be similar. This species is differentiated by having a tubercle on the underside of the abdomen and by having dull orange-brown antennal tips, most noticeable in males. • P. major castaneicolor : This species is easily differentiated by having orange antennal tips. • P. metricus: This species can be differentiated from red-and-black forms by having a restricted dark mark around the ocelli not extending to the antennal bases. Additionally, abdominal segment 2 is strongly convex with no red markings will be beyond this segment. • P. pacificus: This species is similar to dark forms of P. fuscatus but does not overlap with this form due to being restricted to the southern tip of Texas. • P. parametricus: This species is very similar to dark, unstriped forms of P. fuscatus and is differentiated by the sparser punctae on the undersides of the apical abdominal segments. This species often can be differentiated by the lack of red markings on abdominal segment 2 and by the entirely red, unmarked clypeus in females. • P. rubiginosus: This species can be differentiated from red forms by having a restricted dark mark around the ocelli not extending to the antennal bases and by having dull-orange undersides of the antennae. • P. bellicosus: This species is differentiated by the lack of bristly hairs on the antennae and presence of propodeal fovea. Additionally, the body is more dull and less shiny. • P. carolina: This species is differentiated by the lack of bristly hairs on the antennae and presence of propodeal fovea. Additionally, the body is more dull and less shiny. • P. fuscatus: This species is differentiated by the lack of bristly hairs on the antennae and presence of propodeal fovea. Additionally, the body is more dull and less shiny. • P. metricus: This species is differentiated by the lack of bristly hairs on the antennae and presence of propodeal fovea. Additionally, the body is more dull and less shiny. • P. rubiginosus: This species is differentiated by the lack of bristly hairs on the antennae and presence of propodeal fovea. Additionally, the body is more dull and less shiny. • P. arizonensis: This species is restricted to Arizona and having one more abdominal segment lacking a stripe. • P. bahamensis: This species is restricted to the southeastern states on the Atlantic coast and is differentiated by having yellow stripes on all abdominal segments. • P. bellicosus: This species is differentiated by the lack of orange antennal tips and by having yellow stripes on all abdominal segments. • P. dorsalis: This species is easily differentiated by the lack of orange antennal tips and by having yellow stripes on all abdominal segments. • P. exclamans: This species is easily differentiated by having yellow stripes on all abdominal segments and having copious yellow markings on the side of the thorax. • P. apachusThis species is easily differentiated by the more discrete, non-graded red and yellow markings on the abdomen and the presence of spots on abdominal segment 1. • P. aurifer: Red forms of this species are easily differentiated by the more discrete, non-graded red and yellow markings on the abdomen and the presence of spots on abdominal segment 1. • P. comanchuis comanchus: This subspecies is restricted to Texas and is easily differentiated by the black thorax. • P. comanchuis navajoe: This subspecies is restricted to Arizona and is easily differentiated by the black thorax. • P. dorsalis californicus: This subspecies is easily differentiated by the more discrete, non-graded red and yellow markings on the abdomen and lack of contrasting antennal tips. • P. major major-castaneicolor: This subspecies is easily differentiated by the more discrete, non-graded red and yellow markings on the abdomen. • P. palmarum: This species is easily differentiated by the more discrete, non-graded red and yellow markings on the abdomen. • P. carnifex: This species is highly similar to red forms of P. carnifex but is noticeably larger. This species is most reliably differentiated by having a longer oculomalar space and, by inspection, appears to often have antennae with orange not restricted to the tips. • P. annularis: This species is easily differentiated by the yellow apical band on the abdomen. • P. carolina: This species is easily differentiated by the lack of orange antennal tips. • P. rubiginosus: This species is easily differentiated by the lack of orange antennal tips. • P. apachus: This species is easily differentiated by the presence of yellow spots on abdominal segment 2. • P. aurifer: Red forms of this species are easily differentiated by the presence of yellow spots on abdominal segment 2. • P. bellicosus: This species is easily differentiated by the lower degree of yellow markings on the abdomen, particularly the segments at the tip. • P. dorsalis californicus: This species is differentiated by its smaller size and and somewhat hexagonal, "horseshoe"-shaped yellow marks on abdominal segment 1. • P. kaibabensis: This species is easily differentiated by the less discrete, smooth color grading on the abdomen from red to yellow. • P. palmarum : Differences are unclear, though P. palmarum does not appear to overlap with the subspecies of P. major. The two formerly were considered to be different subspecies of P. major. • P. annularis: This species is easily differentiated by having orange antennal tips. Additionally, the underside of the second abdominal segment is less convex. P. metricus generally lacks a yellow apical band, but the presence alone is not diagnostic for P. annularis. • P. fuscatus: Red-and-black forms of species is differentiated by having dark markings around the ocelli extending down to the antennal bases and often has red markings beyond abdominal segment 2. 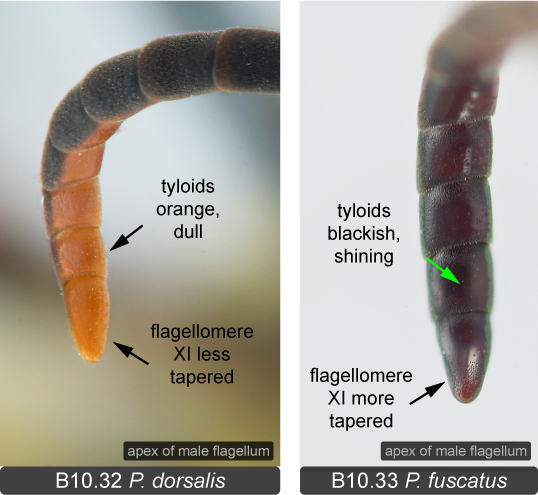 Males can be differentiated by having dark tyloids at the tips instead of orange. • P. major castaneicolor :This species is easily differentiated by having orange antennal tips. • P. parametricus: This species is generally darker, and males can be distinguished by having dark apical tyloids on the antennae. • P. fuscatus: Dark forms occur towards the New England states and do not overlap in range. • P. parametricus: This species occurs towards the New England states and do not overlap in range. Additionally, this species can be distinguished by its prominently red head. • P. kaibabensis: This species is easily differentiated by the smoother, less discrete color grading on the abdomen from red to yellow. • P. major major-castaneicolor : Differences are unclear, though P. palmarum does not appear to overlap with the subspecies of P. major. The two formerly were considered to be different subspecies of P. major. • P. dorsalis dorsalis: Dark forms are differentiated by having an abdominal tubercle. • P. fuscatus: Dark, unstriped forms are differentiated by having more punctae (indentions) on the undersides of the apical abdominal segments. This species often can be differentiated by having red markings on abdominal segment 2 and by often having dark markings on the clypeus in females. • P. metricus: This species generally has more red on the thorax, and males can be distinguished by having orange apical tyloids on the antennae. • P. pacificus: This species is restricted to the southern tip of Texas and does not overlap with the known range of P. parametricus. • P. carolina: This species is differentiated by lacking silvery hairs on the gena and coarse ridges on the propodeum. If the body is marked, with yellow. Notes are based on the work of Dr. Matthias Buck and are an attempt to translate his work from the realm of taxonomy into the common vernacular. Images cited from http://cjai.biologicalsurvey.ca are property of Drs. M. Buck, S.A. Marshall, and D.K.B. Cheung and are referenced as simply the best examples of numerous traits that exist in digital format. Images cited from BugGuide are property of the respective BugGuide uploaders unless otherwise specified.